78th District Court sentencings posted March 22, 2018. 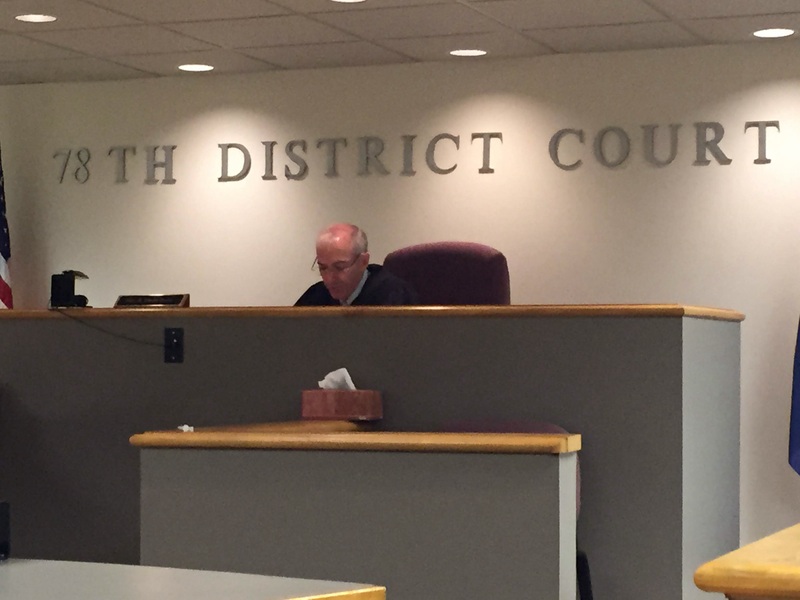 – Milton Herbert Bazinau, 47, of 3929 W. North River Dr., Newaygo, was found guilty March 13 of allowing a person to drive in violation and was sentenced to 90 days discretionary jail over the next year and $290 in fines and costs. One count of second-offense driving while license suspended (DWLS) was dismissed. – Ryan Alan Clouse, 25, of 9115 Johnson Rd., Kaleva, was found guilty Feb. 26 of breaking and entering a vehicle to steal property less than $200 and was sentenced to 93 days discretionary jail to ensure compliance with sentence; credit for time served if imposed; and a $75 fine. A second count of breaking and entering a vehicle to steal property less than $200 was dismissed. – Katie Amber Keller, 31, of 5397 E. Harrison Rd., Walkerville, was found guilty March 19 of domestic violence and was sentenced to 93 days discretionary jail to ensure compliance with sentence; credit for time served if imposed; and $450 in fines and costs. One felony count of aggravated assault was dismissed. – Stephen Michael Ryder, 27, of 3628 Lees Lane, Hart, was found guilty March 19 of operating while impaired by a controlled substance and was sentenced to 93 days discretionary jail to ensure compliance with sentence; credit for time served if imposed; outpatient treatment; and $415 in fines and costs. Conviction reportable to the Secretary of State (SOS). Charges of marijuana possession and operating while intoxicated were dismissed. – Christopher Mark Bainbridge, 25, of 5555 Rhonda Dr., Fremont, was found guilty March 19 of controlled substance possession – schedule 5, LSD and was sentenced to one year discretionary jail to ensure compliance with sentence; credit for time served if imposed; outpatient treatment; driver’s license suspended 180 days/restricted after 30 days; and $925 in fines and costs. One count of marijuana possession was dismissed. – Craig Joshua Bradley, 25, of 820 Tyler Rd., Hart, was found guilty March 13 of allowing a person to drive in violation and was sentenced to 90 days over the next year and $290 in fines and costs. One count of second-offense DWLS was dismissed. – Thomas James Robinson, 37, of 307 S. Rowe St., Ludington, was found guilty March 13 of DWLS and was sentenced to 93 days over the next year and $400 in fines and costs. Conviction reportable to SOS. One count of second-offense DWLS was dismissed. – Jennifer Alice Stamps, 42, of 8451 E. Filmore Rd., Hesperia, was found guilty March 19 of controlled substance possession and was sentenced to one year discretionary jail to ensure compliance with sentence; credit for time served if imposed; driver’s license suspended 180 days/restricted after 30 days; and $400 in fines and costs. – Jonathon James Rutledge, 23, of 314 S. Hart St., Hart, was found guilty March 19 of assault and battery and was sentenced to 93 days discretionary jail to ensure compliance with sentence; credit for time served if imposed; and $400 in fines and costs. Two counts of assault and battery were dismissed. Rutledge was also found guilty of disorderly conduct – drunk and was sentenced to 90 days discretionary jail to ensure compliance with sentence; credit for time served if imposed; and $450 in fines and costs. – Taryn Jae Bajtka, 28, of 95 E. Water St., Newaygo, was found guilty March 19 of operating while intoxicated and was sentenced to 93 days discretionary jail to ensure compliance with sentence; credit for time served if imposed; outpatient treatment; and $1,205 in fines and costs. Conviction reportable to SOS. – Mark Thomas Sturr, 59, of 1525 E. Hammett Rd., Hart, was found guilty March 19 of operating while impaired and was sentenced to 93 days discretionary jail to ensure compliance with sentence; credit for time served if imposed; outpatient treatment; and $1,040 in fines and costs. Conviction reportable to SOS. One count of operating while intoxicated was dismissed. – Pamela Jean Austin, 56, of 2393 W. Bard Rd., Muskegon, was found guilty March 19 of third-degree retail fraud and was sentenced to 93 days discretionary jail to ensure compliance with sentence; credit for time served if imposed; $70 in restitution; and $400 in fines and costs. – Roel Belmares, 23, of 5256 N. 176th Ave., Walkerville, was found guilty March 14 of DWLS and was sentenced to 93 days discretionary jail to ensure compliance with sentence; credit for time served if imposed; and $400 in fines and costs. Conviction reportable to SOS. – Richard Ralph Felt II, 26, of 8130 W. Garfield Rd., Bitely, was found guilty March 19 of operating while intoxicated and was sentenced to 93 days discretionary jail to ensure compliance with sentence; credit for time served if imposed; outpatient treatment; and $1,155 in fines and costs. Conviction reportable to SOS. One count of operating with a high blood alcohol content (BAC) was dismissed. – Daniel Karl Abrahamson, 41, of 1363 E. Wilke Rd., Rothbury, was found guilty March 13 of firearm deer hunting without a license and was sentenced to 90 days discretionary jail over the next year and $335 in fines and costs. One count of taking a deer without a license was dismissed. – David Eugene Slocum, 22, of 950 Marie St., Hesperia, was found guilty March 19 of third-degree retail fraud and was sentenced to 93 days discretionary jail to ensure compliance with sentence; credit for time served if imposed; $70 restitution; and $400 in fines and costs. – Terrie Jean Sawdy, 39, of 1309 N. York Rd., Hart, was found guilty March 13 of allowing a person to drive in violation and was sentenced to 90 days discretionary jail over the next year and $290 in fines and costs. One count of operating without insurance was dismissed. – Danielle Marie Kerbersky, 35, of 7515 S. 88th Ave., Rothbury, was found guilty March 13 of allowing a person to drive in violation and was sentenced to 90 days discretionary jail over the next year and $290 in fines and costs. One count of violation of learner’s permit was dismissed. – Shawn Michael Rosencrans, 24, of 4431 S. 184th Ave., Hesperia, was found guilty Jan. 22 of second-offense operating while intoxicated and was sentenced March 19 to nine days in jail; one year discretionary jail to ensure compliance with sentence; credit for time served if imposed; outpatient treatment; six months probation; and $1,780 in fines and costs. Conviction reportable to SOS. One felony count of assaulting/resisting/obstructing a police officer was dismissed. – Walter Lee Lidster, 43, of 3241 N. 72nd Ave., Hart, was found guilty March 13 of allowing a person to drive in violation and was sentenced to 90 days discretionary jail over the next year and $290 in fines and costs. One count of DWLS was dismissed. – Demarquis Darnell Reed, 23, of 7889 Gratiot Rd., Saginaw, was found guilty March 14 of driving while license not valid and was sentenced to 90 days discretionary jail to ensure compliance with sentence; credit for time served if imposed and $300 in fines and costs. Conviction reportable to SOS. – Ronald Lawrence Hunter, 35, of 4171 Meinert Park Rd., Montague, was found guilty March 14 of improper plates and was sentenced to 90 days discretionary jail to ensure compliance with sentence; credit for time served if imposed; and $215 in fines and costs. – Nathaniel Andrew Lara, 24, of 2544 W. Meadow Lane, Rothbury, was found guilty of March 14 of driving while license not valid and was sentenced to 90 days discretionary jail to ensure compliance with sentence; credit for time served if imposed; and $300 in fines and costs. Conviction reportable to SOS. – Mitchell James Boukamp, 60, of 1726 E. Hammett Rd., Hart, was found guilty March 14 of driving an unregistered vehicle/no trailer plate and was sentenced to 90 days discretionary jail to ensure compliance with sentence; credit for time served if imposed; and $215 in fines and costs. – Dakota Paul Fletcher, 23, of 2289 Loop Rd., Shelby, was found guilty March 14 of improper plates and was sentenced to 90 days discretionary jail to ensure compliance with sentence; credit for time served if imposed; and $215 in fines and costs. – Jorge Alejander Cavazos-Salinas, 18, of 481 Fowler St., Shelby, was found guilty March 14 of allowing a dog to run at large and was sentenced to 90 days discretionary jail to ensure compliance with sentence; credit for time served if imposed; and $155 in fines and costs. – Adam Blake Riddell, 28, of 527 Water St., Hart, was found guilty March 14 of improper plates and was sentenced to 90 days discretionary jail to ensure compliance with sentence; credit for time served if imposed; and $215 in fines and costs. – Ronald Warren Sheafor, 26, of 412 S. Water St., Hart, was found guilty March 14 of driving while license not valid and was sentenced to 90 days discretionary jail to ensure compliance with sentence; credit for time served if imposed; and $300 in fines and costs. Conviction reportable to SOS.